Expedition Health, a new permanent exhibit at the Denver Museum of Nature & Science, is themed around a Colorado mountain expedition and is filled with interactive physical and digital activities. One of the most popular is HUNGRY HIKER Build-A-Meal, upon which this web application is based. The application ties physical activity with good eating habits in a fun and engaging way, as you build a balanced meal to fuel a hiker to the summit. The message is simple: Eat a variety of healthy foods every day. According to the USDA, one in three children in the U.S. is overweight, yet getting kids to follow the MyPyramid guide to healthy eating is difficult. 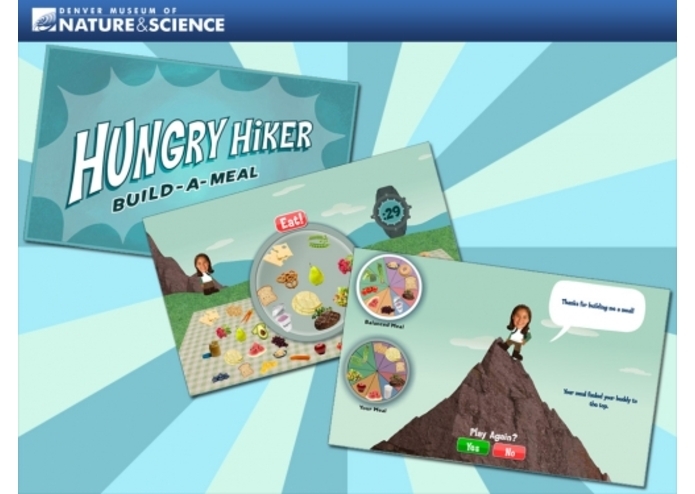 HUNGRY HIKER Build-A-Meal simplifies the notion of balanced eating, adds an element of challenge, and allows kids to practice and improve their performance. Here’s a hint to improve your HUNGRY HIKER score—and your health: Your plate should be half-full of colorful fruits and veggies. As First Lady Michele Obama says, "Eat the rainbow."